The Nation's Dave Zirin is hopping mad that MLB Commissioner Bud Selig has not adequately addressed moving the 2011 MLB All-Star Game from Arizona. To add insult to injury, when a group of prominent activists from Selig's hometown of Milwaukee sent Selig a letter asking for a meeting to discuss the possibility of boycotting Arizona, Selig did not take the time to craft a response. Instead he had his PR guy, W. Carl Mueller, respond. This didn't sit too well with Zirin, who is also from Milwaukee, especially since Selig is in the process of being honored with a statue outside Miller Park, the Bruins' ball park. 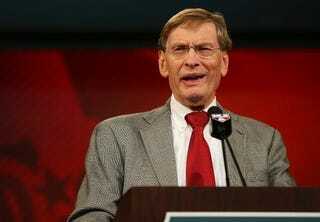 Mueller managed to run off Selig's civil rights record before signing the letter himself. Wow. Echoing what Selig has said before, Mueller stated that the controversy in Arizona is political and essentially not a concern for baseball. Uh-huh. It's a good thing Jackie Robinson didn't think that way. Read the letters and more about this story at The Nation.